Google appears to be the new champ when it comes to feedreaders. Bloglines for a long time had been my number one feedreader. It got bumped off the block by Netvibes, although they've both held fairly steadily. However, with Google now broadcasting subscriber totals, it seems they have a 50% lead over either. Happy days for me as I'd been itching to hit the 5000 mark, only to wake up today to see it hit 6400! For those that rely on advertising, in particular advertising within RSS feeds, I'm sure the more accurate numbers will be helpful. On the flip side, however, is reader attrition. If I stop using Bloglines, and start using Google Reader, does it now look like you have two readers and not just one? What if I stop using these feed readers and give up checking your site altogether? I highly suspect that these online feedreaders will continue to count subscribers as long as their accounts belong in the system. The longer your feed is around, the higher your subscriber numbers are; simply because people haven't closed their accounts. That's an inflated view that certainly isn't reliable. As feeds continue to take off, the onus will be on feedreader developers to broadcast accurate numbers and they'll have to find ways to ensure that only current subscribers are counted. Update: FeedBurner has a post about the view of the feed market which covers the issue of subscriber numbers. Yahoo is the only one that uses the last 30 days as a metric when broadcasting subscriber numbers. All others listed including Bloglines and Google are based on total subscribers. I'd like to see them all fall into line and only use the last 30 days as a baseline for tracking subscribers. I'm using Mint's Bird Feeder to track my subscribers, and that's been fairly inconsistent lately. It will literally change between 100 to 200 subscribers a day. Good to hear it's occurring for other people also. Something must be up. Google seems to be taking over my life, but I don't mind. So far. I guess many people have tried google reader when it first showed. I import immediately my OPML file, used the reader for a week and then dropped it again and started using my previous reader (it was rojo at this time. now it is bloglines). So I guess google figures ,might be incorrect, as it still is counting me as google reader subscriber for your feed, while it shouldn't. Reader attrition is something I hadn't considered. I used Bloglines for the longest time but ever since Google Reader was revamped I switched and never looked back. 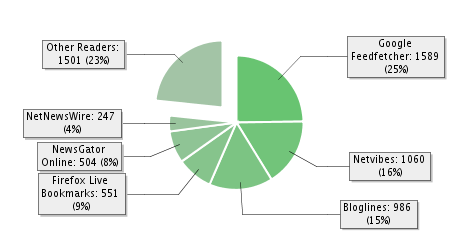 I wonder if my Bloglines account even exists anymore (and if they count me among their active users). I think this explains why my feed count jumped by 100 overnight without any new posts... I knew they were ahead when Google Reader came out and my feed count dropped by 100. I wouldn't have thought that dormant accounts would continue to be counted unless they were being accessed; surely a hit is only made to your RSS feed when the user requests it (by viewing their feeds)? If the readers continued to hit feeds regardless of account activity, hosts would be complaining. @Matthew: I'm specifically referring to services like Bloglines and Google Reader which act as an aggregate for a number of users. The service pings the feed once but represents a whole group of readers. Feedburner (and Birdfeeder) only count people who hit the service within a specific day. But for Bloglines and Google Reader, when do they consider someone no longer subscribed? How do they factor that information in when they broadcast that data? That's the concern for me.